Ever been stuck in a traffic jam and thought, 'Christ, I'd murder an espresso right now'. We certainly have (also while at a wedding, a funeral, and during jury duty). Because espresso machines are bit bulky to lug around with you wherever you go, you either have to make do with the lukewarm coffee from the flask you made seven hours ago, or wait until you're in range of a Starbucks. Until now, baby! 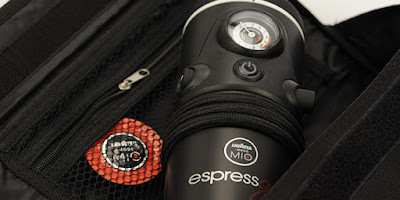 We take the portable Lavazza Espressgo for a ride. 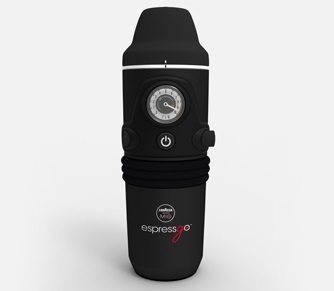 The Espressgo is a portable espresso maker that takes Lavazza's A Modo Mio pods and is powered by your car's 12V port. 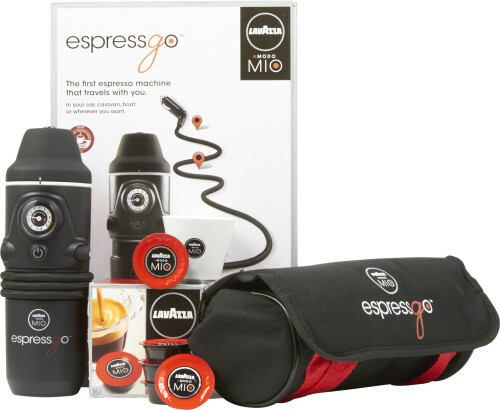 It comes with a carry bag and little espresso cup, as well as a box of 16 pods to keep you going. For two days. Tee hee. The Espressgo has been nicely designed so that the attached 12V adaptor wire can coil around the body of the machine and fasten securely to it, keeping it all small and neat. We can imagine bundling this thing into the glove compartment and whipping it out on those long journeys, or just when you really fancy playing with it while parked on the drive. It's all self-contained, meaning the only thing you actually need to get it up and running is some cold water. 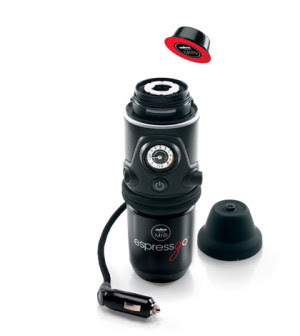 If making an espresso in your car sounds a bit fiddly, the whole task has been simplified by the fact that the Espressgo fits nicely into your car's cup holder. This means it will be kept stable as you unscrew the top, pour in the water (using the included cup for the correct amount), and pop on the capsule. Once ready and plugged in, its a simple job of switching it on and waiting for the pressure to build; indicated by the built-in gauge. Here you might get a bit of a surprise, as the Lavazza Espressgo is a tad noisy. Nothing too annoying, and certainly it doesn't take long at all, but the grinding, whirling sound of it getting up to pressure was a bit shocking at first, especially considering the close confines of the car. Still, it isn't as loud as a kitchen espresso machine and literally takes just a few seconds. We've reviewed Lavazza A Modo Mia before on conventional machines, so we knew how the coffee within the pods should taste. The Espressgo espresso was just as thick, and just as topped with creamy crema, as anything we've had from Lavazza in the past. It truly did taste like a machine espresso, but considering you could have this absolutely anywhere in the world that your car is parked, is pretty remarkable. So if you are a total caffeine fiend, or if you tend to drive long distances and know you'll need a little pick-me-up on the hard shoulder at some point, this is a must-buy coffee gadget.